Before exploration activity can occur on state nonferrous metallic mineral leases, the explorer which is a state mineral lessee must submit an exploration plan to the Minnesota Department of Natural Resources (DNR), which the DNR reviews and replies to. The DNR reply contains conditions and stipulations regarding historic/archaeological sites, natural heritage features (rare plants, animals, and other rare features), designated trout streams, and other special features. The DNR sends the exploration plan to the DNR surface land administrators, such as the area forester and area wildlife manager for review and comment. The lessee is required to contact the surface owner, which may be the federal government, a county, a private commercial company, or a private landowner. This surface owner contact must be made at least 20 days in advance of any activities which will use the surface estate. The public is notified here within 5 business days of DNR receipt of the explorer's proposed plan. If you would like to be notified when an exploration plan has been submitted you can sign up for Lands and Minerals News below. The state has up to 20 calendar days to review the exploration plan and determine if changes are required or if conditions or changes in the plan are required. Examples of conditions or changes include the requirement for the explorer to do a detailed site survey of endangered plants, or to change the location of a proposed access trail. If more than 20 days are required for review the DNR contacts the lessee informing them that more time is needed. After the review is complete the DNR will send a letter to the lessee which the lessee must sign. This letter approves the activities, subject to any requirements that must be met or adjustments made in order for the exploration to occur. Provided below is a list of submitted exploration plans that are currently under review and also those exploration plans that were approved by the DNR. A DNR prepared summary and map for each exploration plan are available to view and download here. The provided information is available for those exploration plans submitted after November 1, 2013. Click on bars to expand for more information and summary map. No plans currently under review. Vermillion Gold Inc. (VGI) proposes to explore for metallic mineral deposits in Itasca County in an area 8-10 miles south of Togo, Minnesota along State Highway 65. VGI plans to drill exploratory borings at 7 sites using the rotosonic drilling method. Upon DNR approval VGI has the right to explore state-owned lands consistent with the exploration plan, any stipulations, and applicable laws and rules. AngloGold Ashanti Minnesota (AGAM) proposes to explore for metallic mineral deposits in Itasca County, Minnesota in an area South of State Highway 1 and east of the Bass Lake Road. AGAM plans to drill exploratory borings at 13 sites using the rotosonic drilling method. Upon DNR approval AGAM has the right to explore state-owned lands consistent with the exploration plan, any stipulations, and applicable laws and rules. Twin Metals Minnesota (TMM) proposes to explore for metallic mineral deposits in Lake and Saint Louis Counties, Minnesota in areas about five miles east of Babbitt and eight miles southeast of Ely, Minnesota. TMM proposes to establish 6 new drill pads upon which monitoring wells will be installed. Upon DNR approval TMM has the right to explore state-owned lands consistent with the exploration plan, any stipulations, and applicable laws and rules. Twin Metals Minnesota (TMM) proposes to do exploration work within existing exploratory borings (drill holes). These borings are located about eight miles southeast of Ely, Minnesota, in Lake County (Figure 1). TMM plans to conduct down-hole geophysical and hydrogeological tests at up to 9 existing temporarily sealed exploratory borings on State minerals leases. AngloGold Ashanti Minnesota (AGAM) plans to explore for metallic mineral deposits in Itasca County within about 5 miles of the junction of State Highways 1 & 65, and in Saint Louis County north of Saint Louis County Highway 22 and south of State Highway 1. AGAM plans to drill exploratory borings this winter on multiple state nonferrous metallic minerals leases on state, county and corporate lands. AngloGold Ashanti Minnesota (AGAM) plans to explore for metallic mineral deposits in Itasca County in an area about 6 to 10 miles west of Togo, Minnesota and south of State Highway 1. AGAM plans to drill exploratory borings this winter on multiple state nonferrous metallic minerals leases on state, county and corporate lands. AngloGold Ashanti Minnesota (AGAM) plans to explore for metallic mineral deposits in Itasca County in an area about 5 miles south of Togo, Minnesota. AGAM will drill exploratory borings on 3 state nonferrous metallic minerals leases over the next 12 months. AngloGold Ashanti Minnesota (AGAM) plans to explore for metallic mineral deposits about 7 miles east-northeast of Effie, Minnesota in Itasca and Koochiching Counties. AGAM will drill exploratory borings on 11 state nonferrous metallic minerals leases over the next 12 months. 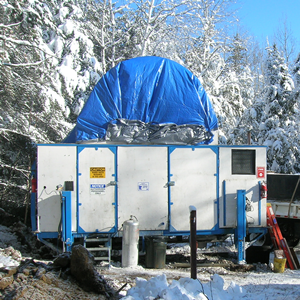 Encampment Minerals, Inc. (Encampment) plans to explore for metallic mineral deposits this winter on state nonferrous metallic minerals leases. Encampment will explore an area about 5 miles south of Hoyt Lakes in St. Louis County by drilling exploratory borings. All work will be done when the ground is frozen. Encampment has drilled in this area since 2009. Upon DNR approval Encampment has the right to explore state-owned lands consistent with the exploration plan, any stipulations, and applicable laws and rules. Encampment will coordinate with other affected parties for access where needed. Vermillion Gold Inc. (VGI) proposes to explore for metallic mineral deposits on State Nonferrous Metallic Minerals Leases beginning fall of 2018. The exploration area is between the cities of Gilbert and Virginia, Minnesota, in Saint Louis County. Exploration activities will occur on foot and consist of mapping and collection of soil samples. Soil samples will be collected with hand tools. VGI submitted the Exploration Plan to the DNR on September 25, 2018. Upon DNR approval, VGI will have the right to explore state-owned lands consistent with the exploration plan, any stipulations, and applicable laws and rules. VGI will coordinate with affected private landowners for access. VGI has been exploring for gold in this area since the year 2007. AngloGold Ashanti Minnesota (AGAM) proposes to explore for metallic mineral deposits by drilling this fall and winter. AGAM plans to drill exploratory borings at 26 sites in northeastern Itasca County, MN. The exploration areas are about 7 miles west and about 4 miles south of Togo, Minnesota. AGAM submitted an Exploration Plan to the DNR for review on September 7, 2018. AGAM will use a rotosonic drilling method. Rotosonic drilling uses high frequency vibration of the drill bit to advance and collect cores of soils, glacial sediments, and a short length of the underlying bedrock. The borings will end after drilling a short distance into the bedrock and then be permanently sealed, according to the exploration plan. Pending DNR approval, AGAM will have the right to explore on state-owned lands consistent with the exploration plan, any stipulations, and applicable laws and rules. AGAM will coordinate with the Itasca County Land Department, Molpus/Meriwether Minnesota Land, as well as any other affected private landowners for access to tax-forfeited and private lands. Kennecott Exploration Company (Kennecott) submitted an Exploration Plan on November 16, 2017. Kennecott plans to explore for metallic mineral deposits on state leases by drilling on 6 to 10 sites this winter and early spring. The drill sites are about 1.5 to 4 miles north of Tamarack, Minnesota, in Aitkin County. Kennecott has been exploring for nickel, copper, and platinum group elements in this area since the year 2000. Pending DNR approval, Kennecott will have the right to explore on state-owned lands consistent with the exploration plan, any stipulations, and applicable laws and rules. Kennecott will coordinate with the Aitkin County Land Department as well as any other affected private landowners for access. AngloGold Ashanti Minnesota (AGAM) proposes to explore for metallic mineral deposits by drilling this winter. AGAM plans to drill shallow exploratory borings at 47 sites in an area east and southeast of Togo, Minnesota. AGAM submitted an Exploration Plan to the DNR for review on November 10, 2017. AGAM will use a rotosonic drilling method. Rotosonic drilling uses high frequency vibration of the drill bit to advance and collect cores of glacial sediments and a short length of the underlying bedrock. Pending DNR approval, AGAM will have the right to explore on state-owned lands consistent with the exploration plan, any stipulations, and applicable laws and rules. AGAM will coordinate with the Itasca County and St. Louis County Land Departments as well as any other affected private landowners for access. AngloGold Ashanti Minnesota (AGAM) proposes to explore for metallic mineral deposits by drilling this winter. AGAM plans to drill exploratory borings at 28 sites in an area that covers less than a township. The exploration area is about 8 miles west of Togo, Minnesota and south of State Highway 1 in northern Itasca County. AGAM submitted an Exploration Plan to the DNR for review on October 31, 2017. Pending DNR approval, AGAM will have the right to explore on state-owned lands consistent with the exploration plan, any stipulations, and applicable laws and rules. AGAM will coordinate with the Itasca County Land Department as well as any other affected private landowners for access. AngloGold Ashanti Minnesota (AGAM) proposes to explore for metallic mineral deposits by drilling this winter. AGAM plans to drill exploratory borings at 10 sites in an area that covers about 4 square miles near County Road 348. County Road 348 is located about 7 miles southeast of Bigfork in northern Itasca County. AGAM submitted an Exploration Plan to the DNR for review on October 18, 2017. AGAM will use a rotosonic drilling method. Rotosonic drilling uses high frequency vibration of the drill bit to advance and collect cores of soils, glacial sediments, and a short length of the underlying bedrock. The borings will end after drilling a short distance into the bedrock, according to the exploration plan. Pending DNR approval, AGAM will have the right to explore on state-owned lands consistent with the exploration plan, any stipulations, and applicable laws and rules. None of the proposed exploration activities, including drilling and the access trails, would occur on private lands. AGAM will also coordinate with the Itasca County Land Department. AngloGold Ashanti Minnesota (AGAM) proposes to explore for metallic mineral deposits, such as gold, on state mineral leases approved September 12, 2017. These leases cover portions of northeastern Itasca County as well as nearby lands in Koochiching and St. Louis Counties. AGAM submitted an Exploration Plan to the DNR for review on October 10, 2017. AGAM proposes surface exploration activities that include geological mapping, which involves visual examination of bedrock outcrops, collection of samples of bedrock outcrops and glacial sediments, and geophysical surveys. AGAM will use hand tools such as a hammer and chisel, hand shovels, hand augers, or portable hand-held power tools such as a posthole digger to collect samples. The ground-based geophysical surveys may include gravity, magnetics, electromagnetics, and seismic methods. These surveys will be done with portable sensors that passively measure properties of the Earth such as gravity. AGAM will gain access to the lands via existing trails and roads and will walk in where needed. No new access trails will be built, no trees will be cut, and no drilling is proposed in the plan. Upon DNR approval AGAM has the right to explore on state-owned lands consistent with the exploration plan, any stipulations, and applicable laws and rules. There are private surface land owners over some of the leased state mineral parcels. AGAM states they will contact each affected land owner at least 20 days in advance with a description of the proposed activity and offer to meet with the landowner prior to doing any exploration activity on those lands. AGAM will also consult with the County Land Departments prior to working on county-administered surface parcels. Encampment Minerals, Inc. (Encampment) proposes to explore for metallic mineral deposits on a state nonferrous metallic mineral lease this winter. The project is about 5 miles northeast of Hoyt Lakes in St. Louis County. Encampment proposes to drill exploratory borings into the bedrock on up to 9 drill sites. Encampment may adjust some drill sites and trails due to local ground conditions and new data. Encampment also drilled in this project area in 2009. Encampment submitted an Exploration Plan to the DNR for review on August 14, 2017. Upon DNR approval Encampment has the right to work on the state-owned surface estate, which covers the new trails and drill sites. Other parties own the surface estate over some of the leased state mineral parcels. The Explorer states they will not conduct exploration activities on those lands or use existing access trails without prior agreement with the landowners. Encampment Minerals, Inc., an exploration company, plans to explore for metallic mineral deposits on 5 of its state nonferrous metallic mineral leases. The project area is about 5 miles south of Hoyt Lakes in St. Louis County. The company has drilled in this project area since 2009 on an intermittent basis. They plan to drill exploratory borings into the bedrock on up to 15 drill sites. The company may need to adjust some of the drill sites up to 500 feet depending on new data and ground conditions. The company states that drill sites will be located no less than 300 feet from the St. Louis River and all work will occur in winter when the ground is frozen. They submitted an Exploration Plan to the DNR for review on July 17, 2017. Upon DNR approval the Explorer has the right to work on state-owned surface, which covers most of these state mineral leases. Other parties own the surface over some of the leased state mineral parcels and adjacent lands. The Explorer states they will not conduct exploration activities on those lands or use existing access trails without prior agreement with the landowners. AngloGold Ashanti Minnesota (Explorer) is conducting exploration activities to search for metallic mineral deposits, such as gold, in the bedrock on its existing 33 state mineral leases in Koochiching County. It submitted an Exploration Plan to the DNR for review on May 19, 2017. The Explorer will perform such activities as geological mapping, which involves visual examination of bedrock outcrops, collection of samples of bedrock outcrops and/or glacial sediments, and geophysical surveys. The Explorer will use hand tools such as a hammer and chisel, hand shovels, hand augers, or portable hand-held power tools such as a posthole digger to collect samples. The Explorer will conduct ground-based geophysical surveys, including gravity, magnetics, electromagnetics, and seismic methods. These methods use portable sensors to measure properties of the Earth such as gravity. The Explorer will gain access to the lands via existing trails and roads and will also walk in where needed. No new access trails will be built by the Explorer. No trees will be cut for this work. Upon DNR approval the Explorer has the right to work on state-owned surface, which covers most of these state mineral leases. There are private surface owners over some of the leased state mineral parcels. The Explorer states they will not conduct exploration activities on private land without prior agreement with the landowner. The Explorer will also consult with the Koochiching County Land Department prior to working on county-administered surface parcels. January 4, 2017: This exploration plan notice amends an approved exploration plan (July 1, 2016) submitted by Vermillion Gold on June 14, 2016. Vermillion Gold amended their exploration plan on December 28, 2016. The amendment adds a new drill site location in section 10, removes a proposed drill site location in section 2, and adds a new access trail in section 9. The amended changes are under review. Amended Narrative: Vermillion Gold, Inc., (Explorer) has proposed drilling 10 drill holes (exploratory borings) over 5 state nonferrous metallic minerals leases in St. Louis County, Minnesota about 8 miles west of Cook. The Explorer will use existing trails or cross open areas to access 8 exploratory boring sites. In order to access the remaining two exploratory borings the Explorer proposes to make 2 new trails in sections 9 and 10. These proposed access trails will cross wetlands when the ground is frozen. The drilling will begin in December of 2016. Theses 5 leases range in age from 4 to 12 years old. There is a mixture of surface ownership interests over the state leases, including the state of Minnesota and private ownership. The Explorer must have agreements in place with the surface owner prior to working on the property. Vermillion Gold, Inc. has held leases in the proposed exploration area since 2004. A business that is exploring for metallic mineral deposits on state mineral leases, Kennecott Exploration Company (explorer), submitted an Exploration Plan on November 29, 2016. The exploration activities are proposed on seven state nonferrous metallic mineral leases in Aitkin County near the city of Tamarack. The company proposes to drill approximately 8 to 20 exploratory borings between December 19, 2016 and April 1, 2017 during which time the ground is generally frozen. The explorer has also proposed to run down-hole geophysical surveys in each exploratory boring that is drilled. The explorer will use existing trails and some new trails to access the exploratory boring sites. The explorer has agreements or leases for the surface and mineral ownership on the parcels involved. Kennecott Exploration Company has been exploring for nickel, copper, and platinum group elements in this area since the year 2000. AngloGold Ashanti Minnesota (Explorer) proposes to do exploration drilling on state-managed mineral rights in southeastern Koochiching County. It submitted an Exploration Plan to the DNR for review on November 2nd, 2016. The Explorer plans to drill thirty-one (31) exploratory rotosonic borings within nineteen (19) active state nonferrous metallic minerals leases. Rotosonic drilling uses high frequency vibration of the drill bit to collect cores of unconsolidated glacial sediment and underlying bedrock. Each boring will end shortly after the top of bedrock is encountered. No drilling fluids are needed. It should take less than a few days to complete each boring. The borings are anticipated to be vertical holes approximately 150 feet in depth. The borings will be permanently sealed immediately after drilling in accordance with Minnesota Department of Health regulations. The Explorer will access the drill sites by paved public roads, existing unpaved frozen winter roads, and/or frozen winter use routes. This proposed work would commence upon DNR approval, and after sufficient frozen ground and snow cover have been established. The proposed exploratory drilling program will not involve areas of private surface lands held by individuals. Pending DNR approval, the Explorer has the right to work on state-owned surface lands, which covers most of the work proposed. The Explorer has obtained authorization from the Koochiching County Land department for work on county-owned surface and Potlatch Holdings for work on their land. The approved plan was amended by the explorer on December 28. 2016. The amended changes are currently under review. See 'Under Review' plans for more information. AngloGold Ashanti Minnesota (Explorer) is conducting exploration activities to search for metallic mineral deposits, such as gold, in the bedrock on its existing 33 state mineral leases in Koochiching County. It submitted an Exploration Plan to the DNR for review on May 27, 2016. Upon DNR approval the Explorer has the right to work on state-owned surface, which covers most of these state mineral leases. There are private surface owners over some of the state mineral parcels. The Explorer is working to obtain access agreements with the surface owners and will not do exploration work on a specific parcel until an agreement with the surface owner is in effect there. The Explorer will also obtain access from the Koochiching County Land department for the county-administered surface parcels. The activities will be conducted from the approval of plan until December 31, 2016. Kennecott Exploration Company (explorer) submitted an Exploration Plan on May 2, 2016 for exploration activity to be conducted on 7 state nonferrous metallic mineral leases in Aitkin and Carlton Counties near the city of Tamarack. The company proposes to conduct two ground-based geophysical surveys over its Tamarack Project. One is a gravity survey. This is a non-invasive measurement that uses a sensor the size of a large coffee pot. It is placed on the ground at 100 to 200 meter intervals for a few minutes to passively measure the earth's gravity field. The other is a magneto-telluric (MT) survey. The MT survey is also a non-invasive technique to measure changes in the earth's electrical and magnetic fields over time. Small recording units will be placed at stations approximately 400 meters apart (roughly one every 40 acres). No trees or brush will be removed for these surveys. The company will capture the locations of every geophysical station with a high accuracy GPS (Global Positioning System). The explorer has agreements or leases for the surface and mineral ownership on the parcels involved. Kennecott Exploration Company has been exploring for copper, nickel and platinum group elements in this area since the year 2000. A business that is exploring for metallic mineral deposits on state mineral leases, Kennecott Exploration Company, submitted an Exploration Plan on April 12, 2016. The exploration activities are proposed on seven state nonferrous metallic mineral leases in Aitkin County near the city of Tamarack. The company proposes to drill approximately 10 to 20 exploratory borings between May 1, 2016 and December 31, 2016. The explorer has also proposed to run down-the-hole geophysical surveys in each exploratory boring that is drilled. The explorer will use existing trails to access most of the exploratory boring sites. The explorer plans to make two new trails to access some exploratory boring sites. The explorer has agreements or leases for the surface and mineral ownership on the lands affected. Kennecott Exploration Company has been exploring for copper, nickel and platinum group elements in this area since the year 2000. Kennecott Exploration Company (explorer) submitted an Exploration Plan on March 31, 2016 for exploration activity to be conducted on 40 state nonferrous metallic mineral leases in Aitkin and Carlton Counties near the city of Tamarack. The company proposes to conduct two ground-based geophysical surveys over its Tamarack Project. One is a gravity survey. This is a non-invasive measurement that uses a sensor the size of a large coffee pot. It is placed on the ground at 100 to 200 meter intervals for a few minutes to passively measure the earth's gravity field. The other is a magneto-telluric (MT) survey. The MT survey is also a non-invasive technique to measure changes in the earth's electrical and magnetic fields over time. Small recording units will be placed at stations approximately 400 meters apart (roughly one every 40 acres). No trees or brush will be removed for these surveys. The company will capture the locations of every geophysical station with a high accuracy GPS (Global Positioning System). The explorer has agreements or leases for the surface ownership on the parcels involved. Kennecott Exploration Company has been exploring for copper, nickel and platinum group elements in this area since the year 2000. February 11, 2016: Kennecott Exploration Company. This notice amends the notice sent February 1, 2016. Kennecott Exploration Company amended their exploration plan described below on February 10, 2016. The amendment extends the time period they expect to do the work to July 30th, 2016. This is the only change from the original plan. Kennecott Exploration Company (explorer) submitted an Exploration Plan on January 25, 2016 for exploration activity to be conducted on 27 state nonferrous metallic mineral leases in Aitkin and Carlton Counties near the city of Tamarack. The company proposes to conduct two ground-based geophysical surveys over its Tamarack Project. One is a gravity survey. This is a non-invasive measurement that uses a sensor the size of a large coffee pot. It is placed on the ground at 100 to 200 meter intervals for a few minutes to passively measure the earth's gravity field. The other is a magneto-telluric (MT) survey. The MT survey is also a non-invasive technique to measure changes in the earth’s electrical and magnetic fields over time. Small recording units will be placed at stations approximately 400 meters apart (roughly one every 40 acres). No trees or brush will be removed for these surveys. The company will capture the locations of every geophysical station with a high accuracy GPS (Global Positioning System). The explorer has agreements or leases for the surface and mineral ownership on the parcels involved. Kennecott Exploration Company has been exploring for copper, nickel and platinum group elements in this area since the year 2000. A business that is exploring for metallic mineral deposits on state minerals leases, Twin Metals Minnesota, submitted an Exploration Plan to the DNR on December 1, 2015. The exploration activities are proposed on a state nonferrous metallic minerals lease in Lake County east of Babbitt and south of Ely, Minnesota. The company proposes doing down-the-hole geophysical and hydrogeological tests at one pre-existing temporarily sealed drill hole (exploratory boring). The company will open the previously used access routes and drill pad to allow trucks and equipment access to the site. No new trails are proposed. The tests inside the boring could take a number of days. The work may begin shortly after all approvals are received. A business that is exploring for metallic mineral deposits on state mineral leases, Kennecott Exploration Company, submitted an Exploration Plan on November 19, 2015. The exploration activities are proposed on four state nonferrous metallic mineral leases in Aitkin County near the city of Tamarack. The company proposes to drill approximately 10 to 20 exploratory borings from December 16, 2015 to approximately April 30, 2016. The explorer has also proposed to conduct down-the-hole geophysical surveys in the exploratory borings. The explorer will use existing trails to access the majority of exploratory boring sites. The explorer will need to extend an existing trail approximately 300 feet to access one of the exploratory boring sites. The explorer has agreements or leases for the surface and mineral ownership on the parcels involved. Kennecott Exploration Company has been exploring for copper, nickel and platinum group elements in this area since the year 2000. A business that is exploring for metallic mineral deposits on state mineral leases, Vermillion Gold, submitted an Exploration Plan to the DNR on November 17, 2015. Exploration activities are proposed on one state nonferrous metallic mineral lease in St. Louis County, near the city of Virginia. The company proposes to drill 1 exploratory boring on the state mineral lease in Section 22 of Township 58 North, Range 17 West. The explorer will need to extend an existing private access trail approximately 75 feet further in length to access the proposed exploratory boring site. There are private commercial property owners in Section 22. The explorer is working on an access agreement with the commercial property surface owners in Section 22 and will not do exploration work until agreements are in effect. Vermillion Gold has been exploring for gold in this area since the year 2007. A business that is exploring for metallic mineral deposits on state mineral leases, Twin Metals Minnesota, submitted an Exploration Plan to the DNR on October 30, 2015. The exploration activities are proposed on four state nonferrous metallic mineral leases in St. Louis and Lake Counties east of Babbitt and south of Ely, Minnesota. The company proposes doing down-the-hole geophysical and hydrogeological tests at 12 existing temporarily sealed drill holes (exploratory borings). The company will open the previously used access routes and drill pads to allow trucks and a drill rig access to the sites. No new trails are proposed. The tests inside the borings could take a number of days. All 12 borings will be permanently sealed after the tests are done. The work may begin shortly after all approvals are received. Some sites will be accessed only in winter when soils are frozen. Twin Metals is seeking separate approval from the Health Department for the hydrogeological tests. A business that is exploring for metallic mineral deposits on state mineral leases, Vermillion Gold, submitted an Exploration Plan to the DNR on June 25, 2015. The exploration activities are proposed on two state nonferrous metallic mineral leases in St. Louis County, near the city of Virginia. The company proposes to drill 7 exploratory borings on state mineral leases in Sections 16 and 22 of Township 58 North, Range 17 West. The explorer will utilize existing trails to access the majority of the exploratory boring sites. The access trail in Section 22 needs to be extended approximately 600 feet farther in length to access the proposed exploratory boring sites. The state of Minnesota owns the surface in Section 16. There are private commercial property owners in Section 22. The explorer is working on access agreements with the commercial property surface owners in Section 22 and will not do exploration work until agreements are in effect there. Vermillion Gold has been exploring for gold in this area since the year 2007. Kennecott Exploration Company submitted an Exploration Plan on April 15, 2015 for exploration activities to be conducted on 3 state mineral leases in Aitkin County, near the city of Tamarack. The company proposes to drill approximately 10 to 25 exploratory borings and conduct geophysical surveys in the bore holes and on the ground. The exploration activities would commence on or after May 15, 2015 and all activities completed by November 6, 2015. The explorer has agreements or leases for the surface and mineral ownership on the parcels involved. Kennecott Exploration Company has been exploring for copper, nickel and platinum group elements in this area since the year 2000. Kennecott Exploration Company submitted an Exploration Plan on March 5, 2015 for exploration activity to be conducted on 12 state mineral leases in Aitkin County, near the city of Tamarack. The company has proposed to complete a ground based gravity (geophysical) survey. The gravity survey is a non-invasive measurement using a sensor of the size of a large coffee pot. It is placed on the ground at regular intervals (100m-200m) for a few minutes to passively measure the earth's gravity field. In addition to the gravity measurement, a high accuracy survey grade GPS (Global Positioning System) location measurement is taken at every gravity station. The explorer has agreements or leases for the surface and mineral ownership on the parcels involved. Kennecott Exploration Company has been exploring for copper, nickel and platinum group elements in this area since the year 2000. Kennecott Exploration Company submitted an Exploration Plan on November 24, 2014 for exploration activities to be conducted on 9 state mineral leases in Aitkin County and Carlton County, near the city of Tamarack. The company proposes to drill approximately 20 to 40 exploratory borings from December 15, 2014 to approximately April 15, 2015. The explorer has also proposed to conduct geophysical surveys in the bore holes and on the ground. The explorer has agreements or leases for the surface and mineral ownership on the parcels involved. Kennecott Exploration Company has been exploring for copper, nickel and platinum group elements in this area since the year 2000. MMG USA Exploration LLC submitted an Exploration Plan to the DNR on August 1, 2014 for exploration activities to be conducted on one state minerals lease in Aitkin County. The explorer proposes to conduct three types of ground-based geophysical surveys within State Minerals Lease MM-10490. These types of surveys will involve walking on the land with portable equipment. This exploration plan is not requesting approval of drilling activity. The surface land on this lease is owned by private parties. The explorer has proposed a Surface Use and Exploration Agreement to the surface owners. There has been active exploration for metallic minerals not far away within Aitkin County continuously since the year 2000, but never on this state minerals ownership block. Encampment Minerals Incorporated submitted an Exploration Plan to the DNR on July 16, 2014 for exploration activities to be conducted on one state mineral lease in St. Louis County. The explorer proposes to drill 1 to 4 exploratory borings at each of the two drill sites during the winter of 2014-2015 when the ground is frozen. The Explorer plans to drill at an angle from the surface of the adjacent federal land parcel, and the angle drilling may cross into the state minerals ownership underground. The Explorer does not propose to conduct any surface exploration activities on the state mineral lease, except for the use of the existing winter access trail. The company has been exploring for copper, nickel and platinum group elements on state mineral leases in this township since 2008. Kennecott Exploration Company submitted an Exploration Plan on July 3, 2014 for exploration activities to be conducted on 3 state mineral leases in Aitkin County, near the city of Tamarack. The company proposes to drill 10 to 25 exploratory borings between July 28 and December 31, 2014. The company also proposes to do geophysical surveys there. Kennecott Exploration Company has been exploring for copper, nickel and platinum group elements in this area since the year 2000. One drill hole is planned on State Lease MM-9764-N in T.61N, R.11, S.4, Lake County, MN. The Minnesota Department of Health (MDH) and Minnesota Department Natural Resources (DNR) are both involved in regulations to protect the environment during metallic mineral exploration. For example there are many rules in Minnesota Rules, Chapter 4727, Explorers and Exploratory Borings, that protect groundwater during exploratory boring. Notify both the DNR and the MDH at least 10 days prior to commencing an exploratory boring. 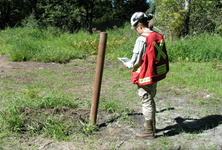 The DNR conducts drill site inspection throughout the drilling activity to assure compliance with all relevant laws. On a state nonferrous metallic minerals lease the explorer must submit an exploration plan (described above) 20 days prior to the start of activities. The DNR reviews these plans prior to granting the right to proceed. Following completion of exploratory borings, the explorer must further comply with state law. They must submit a completed MDH report form that provides details on how the explorer sealed the boring. This ensures that the rules for sealing a borehole is followed. The explorer must also submit a portion of the drill core samples to the DNR upon lease termination. These samples become public property, and this helps to limit future environmental impacts (or duplication of effort) by allowing others to view and analyze the drill core. To put the exploratory drilling activity into perspective, we can compare the small number of exploration borings done to the large number of water wells and other wells drilled statewide. This comparison is based on the MDH data for a period of 11 years. There were 1,031 exploratory borings during the timeframe 2000 through 2010 compared to 128,637 domestic water supply wells and other wells. Therefore, exploratory boring was a very small component of drilling in Minnesota, and represented less than one percent of the total drill holes in the state. 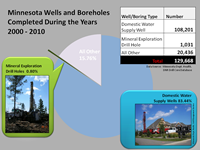 A recent DNR GIS analysis of 46 years of data (1966-2012) concluded that only 2.4% of the state leased parcels for nonferrous metallic minerals had an exploratory drill hole on them. This analysis used exploratory drill hole and state leased parcel data between 1966 and 2012. A subsequent GIS analysis looked at the same information though from the last 5 years (2008-2012) and arrived at similar results (1.8% of the state leased parcels for nonferrous metallic minerals had an exploratory drill hole on them). For information on the DNR's role in environmental review, permitting of mines, inspections, and reclamation rules and standards please visit the DNR's Mineland Reclamation webpage.